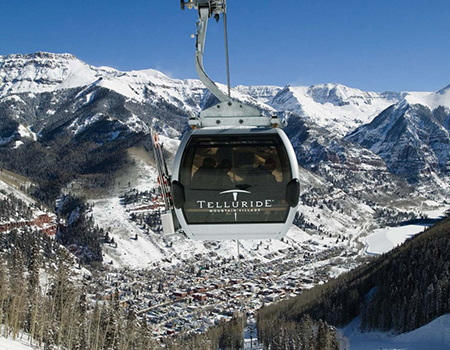 Are you off to Ski Telluride? We have an automatic 20% OFF BLACK TIE SKI RENTALS by booking thru our Telluride Black Tie Ski Form. You MUST use OUR FORM to receive the discount. Fill in the form, get your discount, then call 970-369-7799. Yes there are actual humans at the end of the process.Black Tie Skis offers premium service - a completely addictive way to rent your skis!- they DELIVER TO YOU, PICK UP AFTER YOUR STAY, and resize you at any time. Our contact is Sam McNichols. Don't waste a minute waiting in line at ski equipment rental shops. 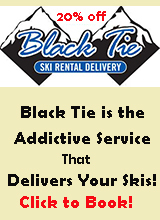 With Black Tie Ski Rentals' delivery service, you can place your order for skis, snowboards, boots and helmets before you arrive. They deliver the equipment and do a professional, custom fitting in your hotel room, condo or vacation home. Great Crested Butte Lodging offers discount ski rentals at most ski resorts - mostly thru Black Tie! Please check our North America Ski Discounts Website!